Buenos Aires may be the capital of Argentina, but the hub of its wine business lies around 650 miles to the west in Mendoza. Dominated to spectacular effect by the Andes, this bustling provincial city owes its existence to the majestic mountain range. Without snow melt for irrigation water, there would be no wine industry, or agriculture, in these near-desert conditions. And without the wine industry, Mendoza would be a dusty backwater. 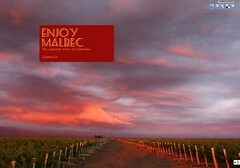 Like Bordeaux, another one of the eight so-called ‘great wine capitals of the world’, Mendoza’s main focus is on vino. The first thing you see when you walk out of the airport, right there on the doorstep of the terminal, is a vineyard, just as it is at Mérignac in the Gironde. Ourwine, it seems to be telling you, is what defines us. The first time I went to Mendoza, in 1993, local winemakers were just beginning to talk about a new – or rather rediscovered – region an hour’s drive to the southwest, in the foothills of the Andes. The focus was still very much on traditional areas close to the city, such as Luján de Cuyo and the sun-baked flatlands of East Mendoza, but the Uco Valley was seen, even then, as a place of great potential.